Ethanol (Pharmco Inc., Brookfield, CT) was mixed 20% v/v in physiological saline (Baxter Healthcare Corp., Deerfield, IL). The 20% ethanol solutions are made by diluting 200-proof ethanol (Pharmco, Brookfield, CT) with 0.9% saline. Intraperitoneal injections are given with volume adjusted according to body weight. Criterion test: pre-treatment qualifying trial; if a mouse fail it is given additional training or practice up to a maximum set of trials. * The 2nd dose of EtOH usually varied from the 1st dose given. •Wire grid (screen), 0.5 cm2 mounted in a wooden frame; when horizontal, the grid (15 cm X 15 cm) is positioned 55 cm above bedding with 2 vertical arms supporting the rotating grid, and the entire apparatus is attached to a horizontal wooden base (see image below). a. 8-week-old mice are initially tested using saline solution. b. After habituation, all animals are weighed and placed back into their home cages. c. The mice are then injected i.p. with saline at five minute intervals and individually housed in holding cages lined with cob bedding. d. Thirty minutes after injection, mice are removed from the holding cage and placed onto the horizontal screen. e. Once the animal grasped the wire, the screen is slowly rotated to a vertical orientation over 2–3 seconds, and the latency to fall is recorded. f. A criterion latency of 120 s is set. g. After all mice are tested, those that fail the first criterion test are given a second attempt. a. The following week each mouse is tested again, this time, under 1 of 4 doses of ethanol (1.5, 1.75, 2.25 or 2.5 g/kg). b. Doses are assigned such that within a cage at least 1 mouse has a different dose from its cagemates. c. Each ethanol treated mouse is tested on the vertical screen (see above) 30 min post-i.p. injection. Mice are allowed to hang on to the vertical screen for a maximum of 240 s. Mice that fail to fall are given a score of 240.
d. On the 3rd week, a week after the first ethanol trial, all mice are again quasi randomized into dose groups and tested on the screen for a second time. e. This time 2.0 g/kg dose and a higher dose are given. Since 1.5 g/kg dose had shown a floor effect, it is withdrawn. Thus, doses for the 2nd ethanol trial are 1.75, 2.0, 2.25, 2.5 or 2.75 g/kg, and are assigned such that no mice received the same dose for both trials. Latencies to fall in the (vertical) screen test after 240 s.
•Hardwood round dowels, 9.5 mm and 15 mm in diameters, mounted horizontally 55 cm above a tabletop, and divided into 4-6 sections (15 cm long), with 8 cm diameter dividers between sections; this configuration allows testing of multiple mice while permitting each a modest degree of movement along the dowel (see image below). •Balance scale for weighing mice before dosing with EtOH. a. 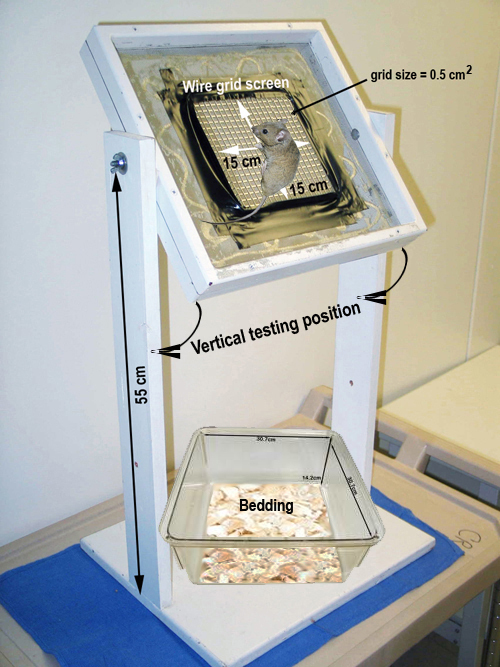 12–16 weeks old mice are first habituated to their testing environment. b. 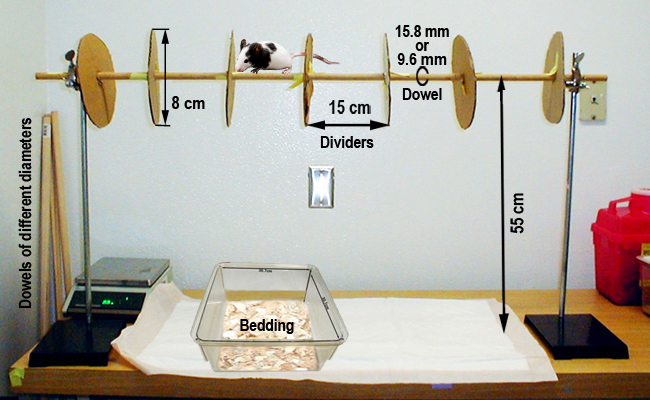 After habituation, each mouse in a group of 4 is placed on an individual section of the dowel so that the length of its body is parallel with the dowel and the mouse is facing the divider, for a two-minute criterion test. c. After all 4 mice successfully complete the criterion test, each mouse in a group is weighed and then injected with a quasi-randomly pre-assigned dose of ethanol (1.5, 2.0 or 2.5 g/kg i.p., 20% v/v); all 4 mice are weighed and injected within one min. d. Immediately following injection, each mouse in the squad is placed on the dowel. e. The latency to fall from the dowel into a cage of bedding (or a maximum score of 300 s) is recorded, and the mouse is then returned to its home cage. f. 30 min after injection, each mouse is again placed on the dowel and tested and the latency to fall from the dowel is recorded. Investigator's notes: "... by this time a substantial level of acute functional tolerance could have developed, contributing to strain differences." g. 10 to 14 days after testing on the 9.6 mm dowel, the mice are tested on a 15.8 mm dowel, using the same dose range and following the same procedure, including the criterion test. h. Mice are randomized into (usually) different dose groups for this test. Latencies to fall at both T0 and T30 are recorded. i. At 35 min after injection, each mouse is placed in a restrainer and the tip of its tail is nicked to draw a 20 µL blood sample for blood ethanol determinations. Latencies to fall during baseline testing and 30 min post EtOH treatment using dowels with 9.5 mm and 15.8 mm diameters. 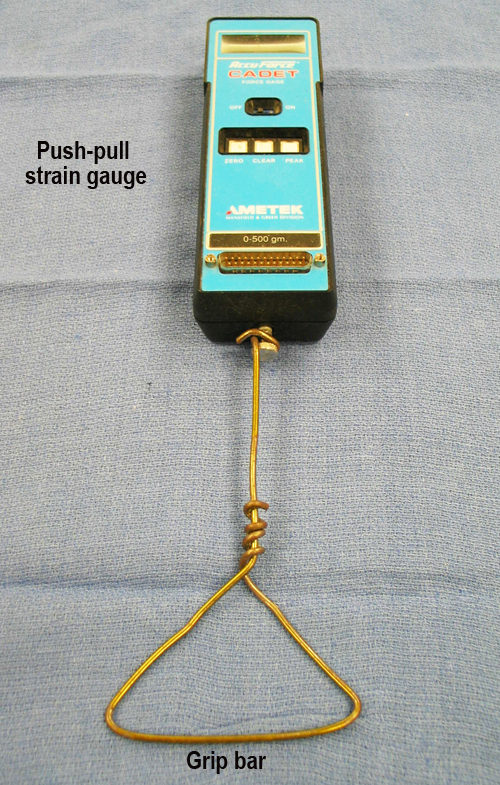 • Push-pull strain gauge (Amtek Accuforce Cadet) for grip strength measurement; a 3 mm diameter triangular piece of metal wire is used as the grip bar (see image below). a. 7–11-wk old mice, housed 2–4 to a cage, are tested for grip strength/endurance. b. On the day of the test, mice are moved to the testing room and allowed to habituate for 60 min before testing. c. Each mouse is weighed and kept alone in a holding cage for the duration of the experiment. d. After all mice are weighed, each mouse is tested for baseline grip strength/endurance. e. A 3 mm diameter triangular piece of metal wire is used as the grip bar (see image above). f. The mouse is then held near the base of its tail and lowered slowly and carefully toward the bar until it grips the bar with both forepaws. g. The mouse is then gently pulled away from the bar at a steady rate of about 2.5 cm/s until the mouse lets go or releases the bar. Investigator's notes: "Pulling the mice away more slowly (<2.5 cm/s) results in many mice prematurely releasing the bar with one or both paws, before their grip is ‘broken.’"
h. Peak force applied by pulling on the mouse is automatically registered in grams-force by the apparatus. After the data are recorded, two additional baseline trials are immediately conducted. i. After obtaining baseline measurements, mice are injected i.p. with 2.0 g/kg ethanol (20% v/v) based on their body weight at 2 min intervals, and then re-tested for grip strength/endurance 30 min following injection. j. Immediately thereafter, a 20 µL blood sample is taken from the tip of the tail for blood ethanol analysis. Additional blood samples are taken at 60, 105 and 150 min. Since in smaller strains it is often difficulty to obtain an adequate amount of tail blood, peri-orbital sinus blood samples are used instead. a. Blood samples are processed and analyzed by gas chromatography. b. Both tail blood and peri-orbital sinus blood are analyzed for ethanol concentration in exactly the same way. c. BEC data are eliminated as statistical outliers when the values are beyond the mean ± 3 SD (standard deviation) at a given time point for all mice tested. Latencies to fall following loss of grip during baseline and 30 min post-EtOH injection. Blood ethanol concentration 30, 60, 105, and 150 min post- EtOH injection.